I brake for GIANT TYPOGRAPHICAL bus stops! Above: Can’t fault this for poor signage. On East Avenue, off Eastern Avenue, next to the Creative Alliance. While the Orioles were hitting ’em out of the park last night at Camden Yards, a Spanish artists collective was hitting a designer’s version of home runs outside Baltimore’s Creative Alliance, where their huge typographic sculpture, which literally spells out the word BUS and serves as a funky place to wait for one, was going viral. “The world’s most obvious bus stop is pure design genius” was the headline on the post in Kristen Hohenadel’s design blog in Slate. Other design-themed publications gushed similarly. 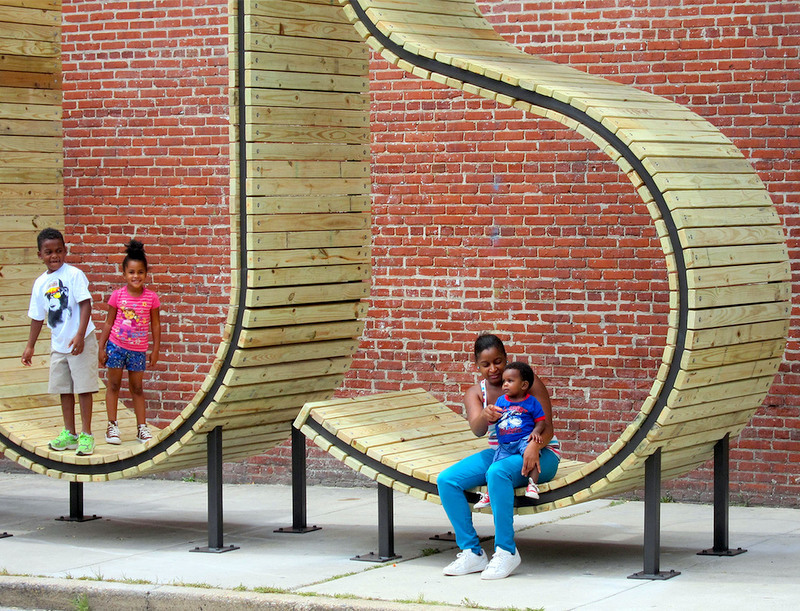 The bench, composed of three 14-foot-high wooden letters and made by the Madrid-based artists’ collective mmmm, was installed last month but, somehow, it’s just been getting a spurt of media love in the last couple of days. “BUS clearly functions as bus stop on S. East [Avenue] in Highlandtown, right next to the Creative Alliance,” mmmm wrote on their website. “The three letters of BUS are big enough to accommodate two to four people each and protect them from rain, sun, wind, and inclement weather. They allow people to assume different postures of sitting or standing while waiting for the bus. The S allows people to lie back while they wait, and the B provides shelter,” the mmmm site explains. Other projects by mmmm’s three artists – Emilio Alarcón, Alberto Alarcón, Ciro Márquez, and Eva Salmerón – have been equally splashy. Here’s the only other one they’ve done in the U.S. so far outside of East Baltimore. It’s a cluster of “meeting bowls” installed in 2011 at Times Square – semi-spherical objects that accommodate eight people, rock gently when you move in them and are intended to promote conversation and intimacy. It took several collaborating entities to bring the international design superstars to a patch of sidewalk next to the old Patterson Theatre. Area residents, they said, had a hand in the process as well. 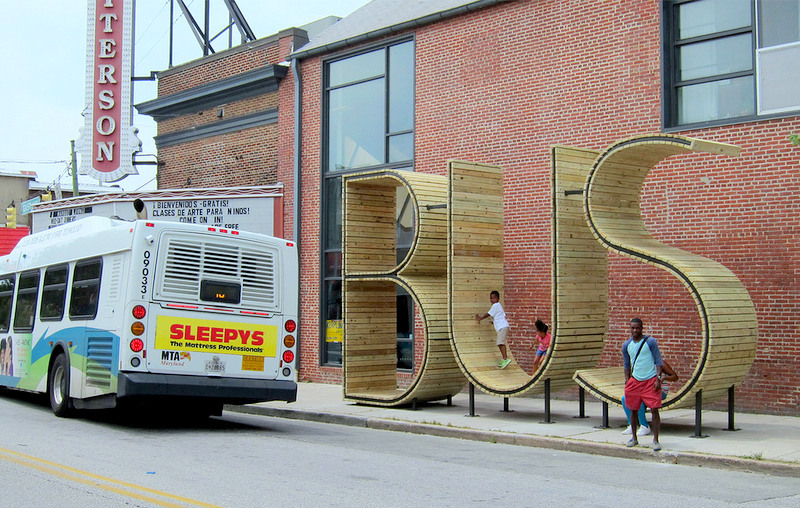 At the streetscape design workshops hosted by the Creative Alliance and Southeast CDC, Highlandtown requested an interactive bus shelter that made a statement for the area’s Arts & Entertainment District. Now if the No. 13 bus would just come on time.